Potioncraft is pretty real and yes, with a little practice you can actually manifest your desires. For many centuries, alchemists, wizards and witches were trying to craft potions which can make their lives easier or more interesting. Here at Magical Recipes Online we love to publish potions which – with little practice can make your dreams come true. But if you could make any potion, which potion would this be? Which Potion would you drink? Take a look at our potions and think about what you desire the most. This can reveal a lot about what your soul craves. Potions correspond to the Magic of Water. The Element of Water corresponds to our emotions and our hearts deepest desires and fears. This test can show you much about all this. What is it that drives you to drink a potion that keeps you young forever? Or maybe let me ask it in a different way. How would your life change? The Green Potion means what you thirst for reconciliation with past choices. The advantage that gives you to stay young is in fact a subtle way to make peace with the past. If you could live in a younger body, you could make different choices and choose a different road that the one you already took. But you know what? Your every choice actually defines who you truly are. Your energy is what actually attracted this fate and this fate is really important for you. You attracted it for a reason. (See more here – collaborating with the Universe). Moreover, if you want to walk a different path, you can start right now. Remember, you are not getting old. You have so many lives ahead to live. If you need extra help on that, check our past lives oracle. Which are the lessons? Think deeper. Behind beauty lies harmony. This is the Virtue you need to focus on. The second potion is what can make you a mermaid – merman. Why would you choose to become one? To become a mermaid – merman, is to actually escape from this world. You probably find it difficult to commit yourself fully in a relationship or in some aspect of your current life. Something has really left you exhausted. Something has left your drained and stripped from you magic. Your desire is to come back to the see and dive into it’s endless possiblities. Although we can indeed help you attract and communicate with the merpeople (see all about the Witch Stones) what you really want is to break free and escape from what’s bothering you right now. You want to ‘disconnect’ with the toxic people – or toxic relationships – which keep you trapped from your true purpose. Something that could really help you out is to find a way to achieve astral projection. In this way, you will also meet the mermaids and mermen or even travel anywhere you want. Magic is in your hands. This is the black potion. A magical potion which makes you invisible. You can walk and attract no attention. But why? What you probably feel is that you can no longer choose what you trully want in you life. All your decisions are pre-maid and you can only follow them blindly. Do you feel trapped in a long-term relationship for which society has put the rules (and not you?). This black potion could give you time and space to have some fun without prejudice or criticism. If you truly want to drink this potion then you should probably find a way to entertain yourself more. Surely magic can help you. If you feel that you’ve being watched then we’ve got something for you. Lucid Dreaming is the ability to control your dreams and make them vivid. No one can see what you are dreaming right? Plus you could have so much fun for 8 hours every day! Slowly, and within your dreams you may also find answers which can help you get much fun in your true life too. Moreover, you can actually travel in spirit form – astral projection and actually be invisible. Cool right? I have to admit. That’s kinda cool. Having power over fire is called Pyrokinesis and I LOVE IT. But you know, there is a common trait between those who can actually control fire. Pyrokinetics are the ones whose emotions are so strong that can actually radiate this energy from their aura. Fire is one of the purest forms of energy and our strongest emotions are linked with fire. If you truly want to control fire you may actually want to control all these raving emotions inside you. Love, passion, anger, anger… all live inside you now. Do you have a crush? Are you outraged? Have you been seeing weird dreams lately? These dreams are in fact disguised impulses which you constantly try to push and hide. But guess what? You cannot hide from yourself my dear. You can only postpote the inevitable. First of all, you need some proper grounding. This technique will help you see these feelings more objectively and define what’s more important for you. Fire is not easy to handle. You may need some time. 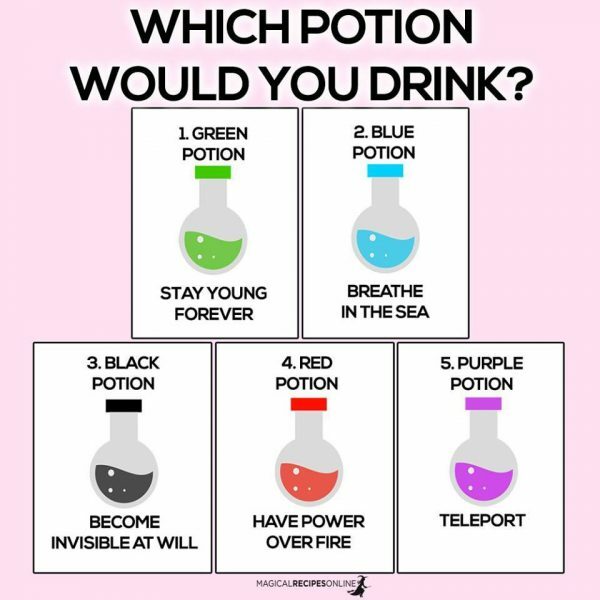 This magic purple potion actually gives you the ability to teleport anywhere in time or space. Amazing right? But what actually drives you to choose it? Well, for starters, choosing this potion denotes your passion for finding your true purpose in life. You may already feel pretty good about your choices but there’s something missing. Is it companionship? A spiritual endeavour ? This purple potion means that you need to make some quality time for yourself in order to evaluate who you truly are right now. Do you want to stay? Or do you want to move? You need to explore more and that’s good. There are many ways to achieve that. First of all you can use your dreams to teach you important things. You can also use powerful Astral Projection magic to actually be able to travel and teleport ANYWHERE. The astral body knows no limits. You can also use divination in order to find the truth. But more importantly you can use the magic of the Fool (from Tarot) to begin any new spiritual or physical journeys. Source and courtesy of MagicalRecipesOnline | Be sure to follow them on Facebook for more great content like this.